The weight of the yarn determines the size of the flower. Use needles a size or two smaller than recommended on the yarn label. 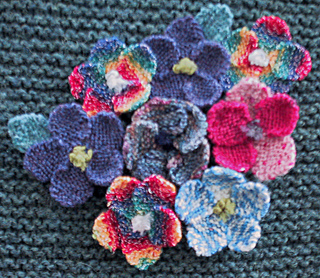 Sock yarn makes wonderful small flowers that can be appliquéd onto anything or attached with a small brooch pin. The self-patterning sock yarn or hand painted sock yarn worked in garter stitch over a small number of stitches blends the colors.